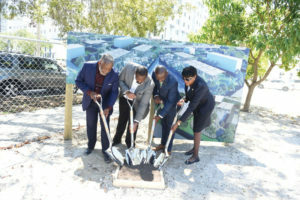 MIAMI, FL – On Wednesday, April 18 at 11:30 a.m., elected officials and South Florida based community development organization, Urban Philanthropies (UP) broke ground at “The Urban,” a new open-air space slated to open this summer in Overtown, one of Miami’s oldest neighborhoods. Elected officials including Commissioner Audrey Edmonson, Radio Personality Papa Keith of South Florida’s 103.5 The Beat and residents celebrated “The Urban” groundbreaking at the development site located at 1000 N.W. Second Ave. Located in the heart of Overtown, the new on trend entertainment hub, “The Urban,” will house a space infused with art, music, culture, a food market and special events. The hub will provide a space for neighbors to connect, friends to meet new friends and visitors to take in the culture. Urban Philanthropies focuses on preserving, empowering and transforming disinvested communities like Overtown. UP Board Chairman, Craig Emmanuel said that this development is more than an entertainment space. “We have invested into the community of Overtown with this development. Our goal is to institute the surest and safest method to uplift the residents. To invest in community independence and establish a path to sustain generational wealth,” said Emmanuel. Serving as the Master of Ceremony, Papa Keith emphasized the historic importance of the Overtown community and acknowledged the people who played a part in getting the project off the ground. Keon Williams, Assistant Director of Urban Philanthropies said that “The Urban” project is both historic and exciting for Overtown. Gail Hamilton of Junction Management revealed “The Urban’s” community centered programming, which will include family focused events, art exhibitions with local artists, STEM children’s events, happy hours, meet ups and more. Junction Management will manage the open-air entertainment hub and provide programming for the community. Hamilton closed the ceremony by restating the commitment that “The Urban” project has to the Overtown community. Hamilton closed the ceremony by restating the commitment that “The Urban” project has to the Overtown community.